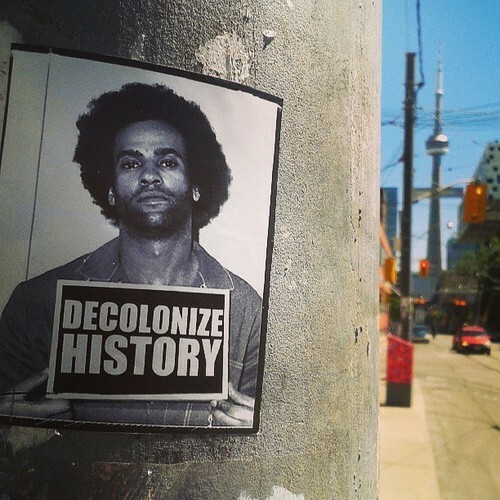 #DecolonizeHistory was a Toronto-based sticker-art storytelling project aimed at interrupting space, addressing colonial roots and publicly addressing white supremacy. Historical narratives within mainstream discourse are presented without the context of colonization, slavery and imperialism, despite the fundamental role they play on all aspects of life. Within these erasures, there are narratives we are told at the expense of silencing other narratives that are actively unrepresented. 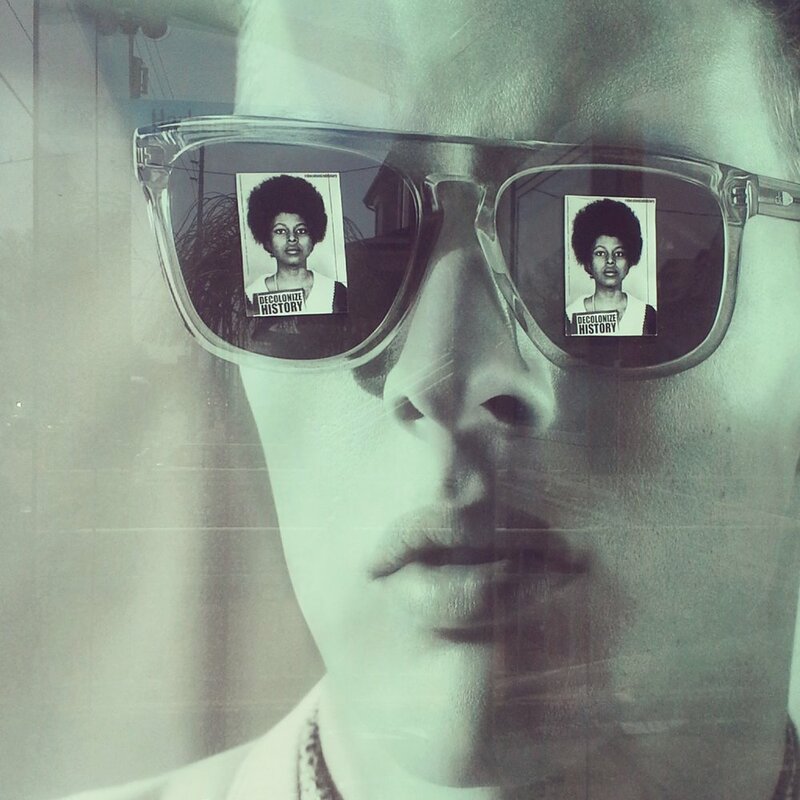 I began with (some) injustices on my mind: Trayvon Martin, subject to a system of racism that never served to protect his life, Omar Khadr, a Canadian citizen arrested and detained in Guantanamo Bay when he was 15 years old, and Assata Shakur & Huey Newton, labelled “terrorists” for actively resisting systemic racism on stolen land. After launching, I received many suggestions to expand the project and to add the stories of Leila Khaled, Mohammad Mossaddegh, Mumia Abu Jamal, Leonard Peltier, Ericka Huggins, Renisha McBride, Nabila Rehman, and Ali La Pointe. Note: Inspired by Eve Tuck and K. Wayne Yang’s “decolonization is not a metaphor”, I retired this project in 2015 to further think through my own relationship to decolonial futures and more specifically, the importance of centering land and Indigenization in (attempted) decolonial art. I keep the works up in part to stay publicly accountable for what I see as my shortcomings and in part because this was a collaborative project that extended far beyond me and I feel obligated to archive the stickers that people put up from Toronto to Cairo to Berlin to London to Tehran to Brooklyn to Montreal to Bridgetown.